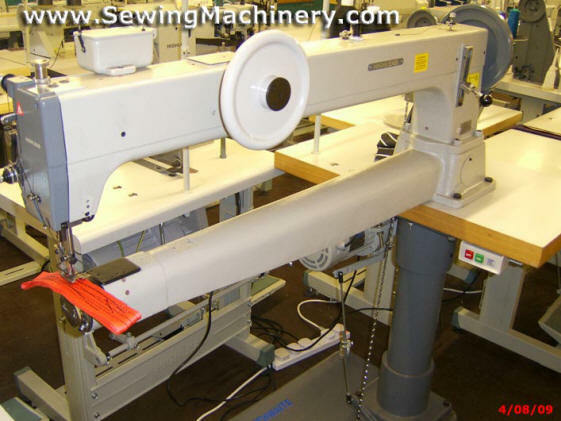 Long Cylinder Arm Extra Heavy Duty Walking Foot Sewing Machine. 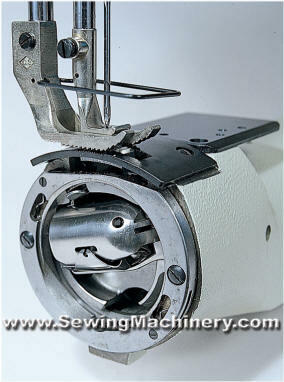 The GA2688-L is Highlead's special extended extra heavy duty extra long cylinder arm sewing machine. The sewing machines cylinder shaped arm has been extended to give approximately 960mm clearance to the right of the needle. It features an extra heavy duty triple feeding action by way of: bottom feed, needle feed and walking foot top feed. It is fitted with an extra large shuttle hook assembly (204 type) for use with heavy weight & extra heavy weight materials and threads. The special extra large shuttle hook and bobbin capacity offers high efficiency in sewing products using extra thick thread. The presser foot has an extra high lift and can go up to 20mm, allowing for a large range of extra heavy weight material to be used. Available complete with extra heavy counter weight pedestal unit stand which allows the cylinder arm shape to overhand, giving greater access. Extra heavy duty cylinder arm. Extra heavy duty feeding action.